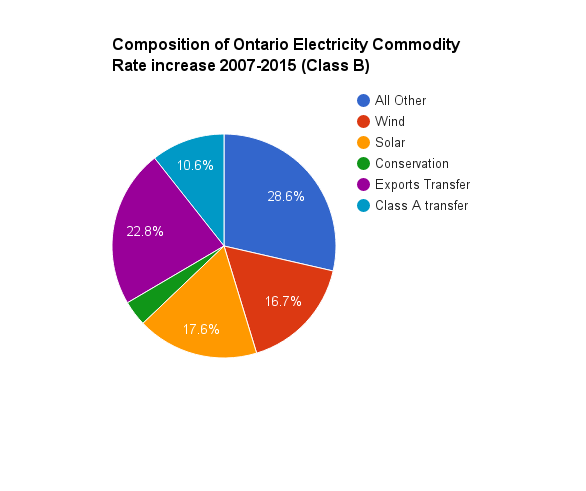 During 2015 most Ontario consumers experienced a 12% rise in the commodity price of electricity. The figure is higher than the 8% average annual increase over the past 8 years, but follows the trend of rate increases that was predictable, and if predictions had been heeded properly, largely preventable. In this post I'll note the actions driving the cost of a kilowatt-hour for the common Ontario ratepayer 85% higher over the past 8 years. In my first post summarizing 2015 figures, I graphed the annual increases in the global adjustment and accompanied declines in the costs recovered through market sales. From 2007 to 2015 the total cost of electricity supply in Ontario grew from around $8.8 billion to $13.7 billion. The move away from recovering costs through market sales is important, but to find the most basic cost drivers we should first find elements of the $4.9 billion supply cost increase, and then explain the rate escalators taking the 55% increase in supply costs to an 85% increase in the supply price for most Ontario ratepayers. If cost increases still surprise some, it must be that the topic is too complicated for most, because clear warnings have existed. Price forecasting took a huge jump in Ontario with Bruce Sharp's August 2010 report prepared for the Canadian Manufactures & Exporters (CME). Prior to the report the price speculation attached to an escalated push into renewables came from the push's instigator, George Smitherman: "We anticipate about 1% per year of additional rate increase associated with the [Green Energy and Green Economy Act] bill’s implementation over the next 15 years." Sharp's August 2010 estimates put the cost much higher - at about $30/megawatt-hour (MWh) for the renewables supply with additional cost for distribution and transmission charges due to the Green Energy and Green Economy Act. The provincial Long-Term Energy plans following Sharp's report seemed to adopt his numbers, and consequently his forecast altered the reality slightly. Nonetheless, 2015's enormous $9.96 billion global adjustment total is only 2% off the total Sharp predicted in a second report 4 years ago. In my second post summarizing 2015 figures I demonstrated my estimates, inclusive of cost for distribution-connected (Dx) supply, largely agreed with the planned expenditures attached to 2013's long-term energy plan. It is important to note the system operator [IESO] current reporting on 2015 totals is only for "supply connected to the high-voltage transmission [Tx] system." The IESO's Tx reporting, as I've previously communicated, provides an increasingly inadequate image of Ontario's electricity generation - and it's encouraging this is being recognized by sector commentators as diverse as Parker Gallant and Tyler Hamilton. Calculation exclude other costs included in global adjustment (such as conservation spending". See footnote 1 data. The IESO's failure to develop reporting on generation from contracted supply within local distribution networks is now missing reporting on about 10% of Ontario's supply costs - mostly attributable to solar panels. There are many people, dominant in Toronto's media circles, that seem to welcome higher electricity costs. A recent article in the Toronto Star ended with, "We can keep grumbling about the loss of cheap power, or we can grapple with our electricity reality — a prerequisite to generating better outcomes." If the readers of such nonsense want better outcomes, they need to know Ontario's recent pricing history so that they may understand the inability to raise rates in some sectors has led to cost shifting away from the province's industry and exporters, toward most Ontario ratepayers. the rest of us - either directly as “Class B” consumers or through the regulated price plans that set that rate). The "Class A" designation was introduced for 2011 specifically to allow industries requiring large amounts of electricity to compete with other jurisdictions. It allows Class A consumers to reduce the share of the global adjustment charge they are required to pay. Consequently, lower market rates should benefit Class A consumers to the detriment of the rest of Ontario's ratepayers. Exporters pay no global adjustment rates at all, so the tool allowing Class A consumers to purchase electricity at lower rates also leads to losses on exports. Contracting expensive supply on the naive premise that energy should be expensive didn't allow the full cost of electricity to be passed on to industry or the export markets that most of the most recently contracted supply is dumped on. 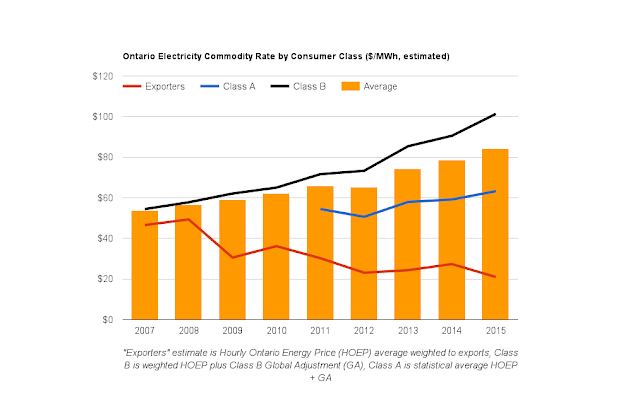 Proponents of wind and solar energy can blame the higher cost of Ontario electricity on supply existing prior to 2008 and the 2 nuclear reactors that returned to service since that time, but we know that wind has the greatest impact on depressing the market price, thus increasing the cost shifting to the Class B Ontario consumer. I displayed the impact of wind on pricing when writing on the Tom Adams and Ross McKitrick study that revealed a multiplier effect through an entirely different analytic process. We know less about solar than wind because we have such poor reporting from the IESO on solar cost and/or value. The omission was understandable in the past when a separate entity contracted supply and settled accounts -the now defunct Ontario Power Authority- but a year after the IESO absorbed that entity it should have advanced reporting to include preliminary figures inclusive of distributed generators. The commodity charges for electricity in Ontario are still rising. The Regulated Price Plan (RPP) rates most Ontario residents will be familiar with equate with the Class B rates in the post in that the RPP is a prediction of the Class B rate for an upcoming period. While the Class B rate averaged a little over $101/MWh for 2015, by December the RPP average rate was over $107/MWh - almost double what it was in December 2007. This indicates commodity rates are expected to continue moving higher. Other electricity costs are more difficult to analyze. There are dozens of local distribution companies each with a variety of consumer classes, so distribution charges vary widely. The Ontario Energy Board's annual yearbooks of distributors indicate a roughly 30% rise since 2007 - a significant chunk of which would be due to smart meters, and another chunk to connecting distributed supply. I was contacted by a researcher from overseas during 2015, asking what Ontarians had against smart meters. After an interesting discussion following my introduction that I'm a bit of tech geek with nothing against smart meters but a deep dislike of waste, I e-mailed proof I paid $3.92  plus $.79 each month for the privilege of a smart meter. Sadly the researcher ended up with information on how poorly represented Ontario's consumers were, and that's about all. The IESO's inability to report on distributed generation is another reason to bring up distribution charges. The IESO is tasked, and funded, to maintain the data repository for Ontario's millions of smart meters. It is hard to see how they could provide value doing so if they are incapable of summarizing the meter totals for the far smaller number of generators - suppliers they pay based on generation totals. The IESO must do better in 2016 if Ontario is to become capable of providing value in its electricity sector actions, and they must do so with their existing resources. Hydro One's financials suggest about a 30% increase in costs on the transmission side. Neither transmission or distribution increases are negligible, but it's unlikey they have hit as hard as the supply cost increases. Value for money should be an expectation Ontario's consumers of electricity can have. The Auditor General of Ontario noted the unnecessarily healthy additions to rate offers following former Minister Smitherman's Green Energy Act will add $5-$9 billion to our bills, depending on how you do the accounting. For this we got almost no contractors bringing projects to completion within 3 years, as contracted. The enriched amounts were to build an industry, but Ontario's renewable industry is not known for providing value to consumers. This past November WindPower Monthly cited "balance-of-plant costs... as much as US$1,000/kW higher than the US" causing "a giant cost disadvantage when compared to the US." The solar side is no better. The constant press about falling solar panel prices doesn't match the solar industry's commentary during a 2016 feed-in tariff (FIT) price review. The IESO reported "All but one submission recommended that current prices remain the same or be raised." 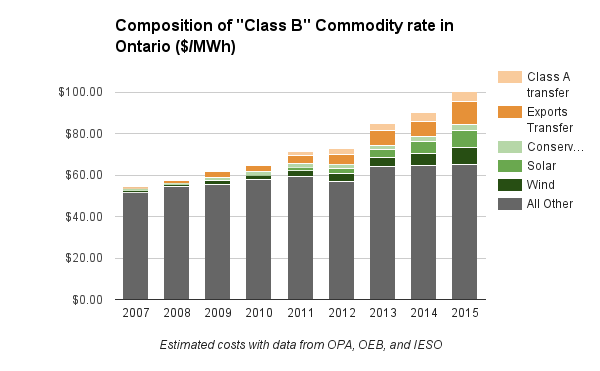 The same slide deck included, "the continued cost reductions in solar PV that are being observed in other markets are not being observed to the same extent in Ontario." Among the positive notes from 2015, the IESO did lower the pricing for future FIT offers. Another positive from 2015 was a December agreement with Bruce Power to facilitate the refurbishment of all reactors at the Bruce site, and in January OPG was also given the go-ahead for Darlington's refurbishment. The agreements promise power for decades to come at about the same prices currently being paid for nuclear supply. Should costs increase, all projects reportedly have off ramps, and the first refurbishment, scheduled to take 40 months, will be completed before others begin. This puts, I think, pressure on OPG to succeed, technically and economically, in that first refurbishment. There certainly does seem to be a white-collar cabal in Toronto, although the failure to control costs doesn't indicate it's expert in engineering or project management. I started 2015 writing on "stakeholders" (exporters, producers, and consumers) driving up the costs for Ontario's mainstream consumers of electricity. The year's final month saw columns from many of the stakeholders, including heads of the power producers lobby, major power consumers lobby, and the head of Ontario Energy Association, rebutting the Auditor General of Ontario's superb Electricity Power System Planning audit. By the measurement of creating white-collar jobs, the stakeholders themselves are Smitherman's success. But over the last decade, this power system planning process has essentially broken down, and Ontario’s energy system has not had a technical plan in place for the last ten years. The true intent of the renewables lobby in Ontario was always to push nuclear out of an energy mix. It was never a greenhouse gas reduction strategy, nor a coal replacement strategy. The government's recent agreements to extend nuclear units provides one indication the push into renewables failed - and the government should recognize that and, in 2016, ignore the white collar collaborators of the GEA in abandoning the 10,700 megawatt target - a target that never made sense outside of inflating prices to strengthen arguments for abandoning baseload nuclear supply. The elimination of targets from variable intermittent suppliers should be accompanied by the cancellation all FIT contracts announced prior to August 1st, 2011 that have not yet reached a substantial state of completion four and half years later. The change in policies would be easily explained by the failure of the renewable procurement policies that followed the elimination of professional planning in the province - a failure demonstrated by the high inflation in electricity cost experienced by Ontario consumers over the past 8 years. If you noted the $12.7 billion here, as "Total (Cost and Production for Ontario)" does not contradict the $13.7 billion " the total cost of electricity supply in Ontario" in the main article includes the cost of supply for export (shown here as $475 million) and other charges included in the global adjustment including "conservation" spending (I've estimated at ~450 million and some smaller miscellaneous charges). Through our projected investments and expenditures as part of the Green Energy Act, electricity prices are expected to rise approximately 1% annually, on average, over the next 15 years for ratepayers. How much am I paying for my smart meter now? All Hydro One customers are currently paying $3.92 per month to recover smart meter-related costs. These costs have been reviewed and approved by the Ontario Energy Board and are a part of the Delivery line item of your Hydro One bill.